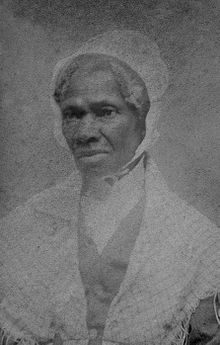 Sojourner Truth (c. 1797 – 26 November 1883) wis the sel-gien name, frae 1843, o Isabella Baumfree, an African-American abolitionist an wimmen's richts activist. Truth wis born intae sclavery in Swartekill, New York. Her maist faur-kent speech, 'Ain't I a Woman? ', wis delivered in 1851 at the Ohio Women's Rights Convention in Akron, Ohio. Wikimedia Commons haes media relatit tae Sojourner Truth. This page wis last eeditit on 19 Februar 2018, at 18:43.